I haven't been traveling lately because of my bone pain. So, I was really feeling bad that I would not be able to go to Kolkata. 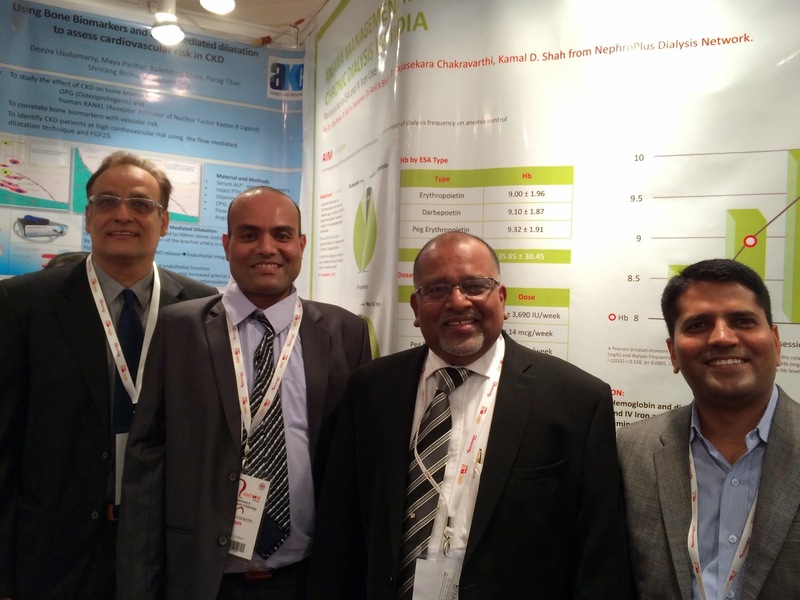 The Annual Conference of the Indian Society of Nephrology, called ISNCON at Kolkata was where NephroPlus was presenting two oro-posters, as they call it. 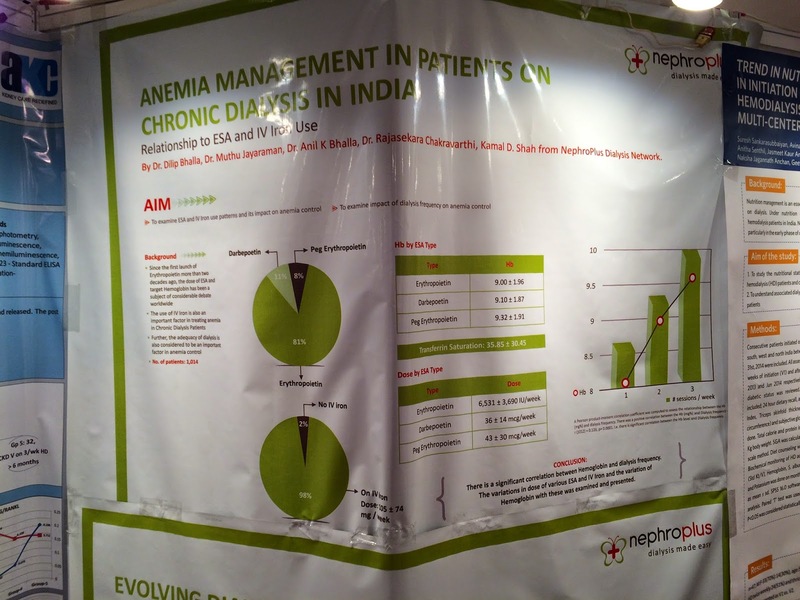 For the first time, we had analysed a large amount of data and came up with two significant abstracts based on possibly, the largest ever Indian patient base! I was involved in this project right from conceptualisation to actualization. I thought about it long and hard and decided to bite the bullet and go to Kolkata. It was more than 20 years since I had been to Kolkata. The last time was even before kidney disease had struck. It was on a holiday to Darjeeling with my family. Now, of course, West Bengal has broken off from the shackles of the Left Front and was being governed by someone who promised to bring in poriborton or change. I was there for too little time to reach any conclusion on whether there was any change or not. From TV debates, it does not seem that much has changed on the ground. But then, TV debates are hardly any indication of what the truth is! From the brief journeys by cab between the airport and hotels, one thing struck me. There were vast swaths of wasteland interspersed with posh looking buildings which were quite a contrast. The main purpose for which we went to Kolkata - the presentation of our abstracts - was on the morning of Friday at the Hyatt Regency near Salt Lake Stadium. As soon as we got there, we got to work. We set up the posters and then got ready to take questions. There was quite a bit of intrigue for our work. The judge came after about an hour and a half of setting up the posters. She was very interested in the paper on 'Evolving Dialysis Practice Patterns in India'. 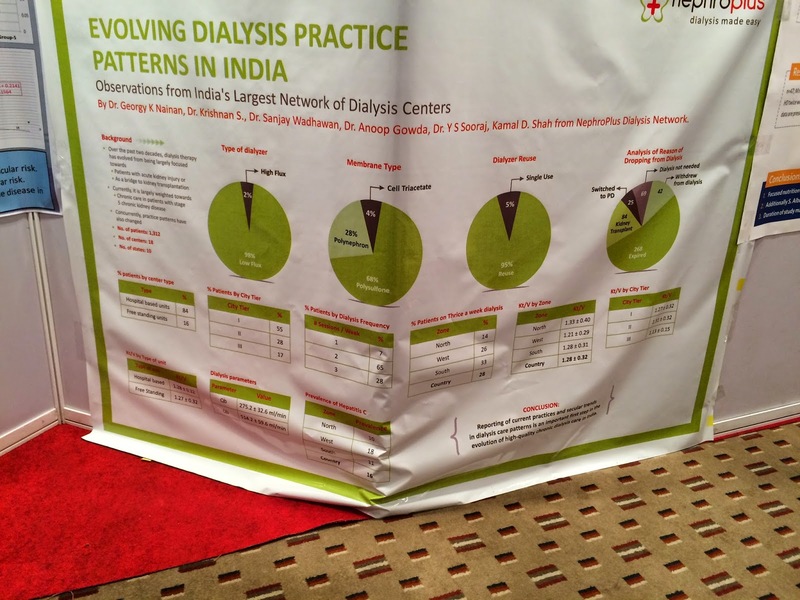 Indeed, we had, for the first time in the country documented dialysis care patterns in India in such a large number of patients! Being the largest dialysis provider in the country, NephroPlus has a huge advantage because of its presence in different parts of the country which makes the population being studied all the more representative rather than most other studies which are typically from one hospital or at best one small part of the country. "Evolving Dialysis Practice Patterns in India"
"Anemia Management in Patients on Chronic Dialysis in India"
From L to R: Dr. Dilip Bhalla, me, Dr. Georgy Nainan, Vikram. Almost everywhere you looked inside the Hyatt, you would see a nephrologist! 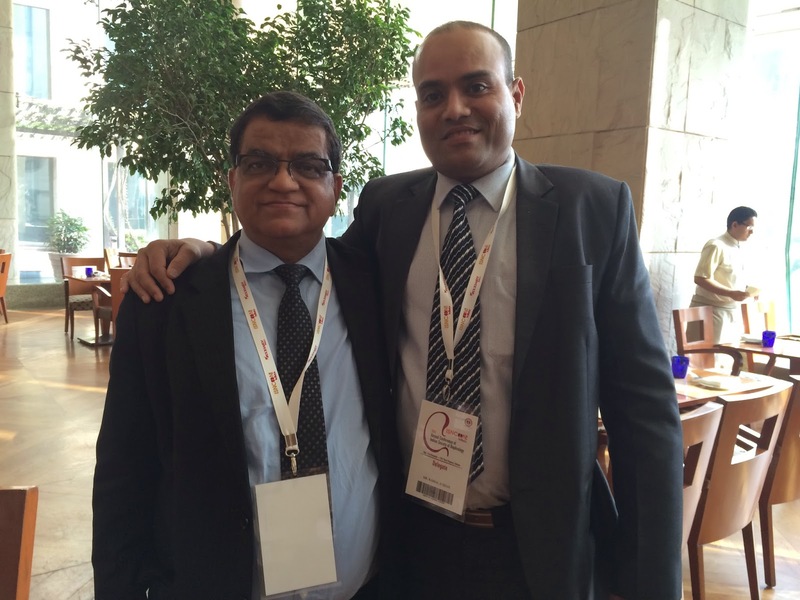 The ISNCON is the single most important event in the Indian Nephrology calendar. Most nephrologists make it a point to attend this conference. While talking to the delegates, I learnt that the participation has been improving steadily. A few years back, while they would receive about 50-60 abstracts, the number has been continuously rising and this year, they received about 300 abstracts! The attendance at the lecture halls has also been very encouraging of late with this year seeing barely an empty seat for most talks! I got an opportunity to meet with some of the stalwarts of the Indian Nephrology community, most of whom were very happy to meet someone who has been on dialysis for almost eighteen years! With Padmashri, Dr. D. S. Rana, Gangaram's Hospital, Delhi. The two days at ISNCON were so packed that I did not get a chance to sample any traditional Bengali fare. So, at Kolkata airport, I was keen to correct this. Luckily, I found a food court where I got a chance to try the Jhal Muri and the Mishti Doi. 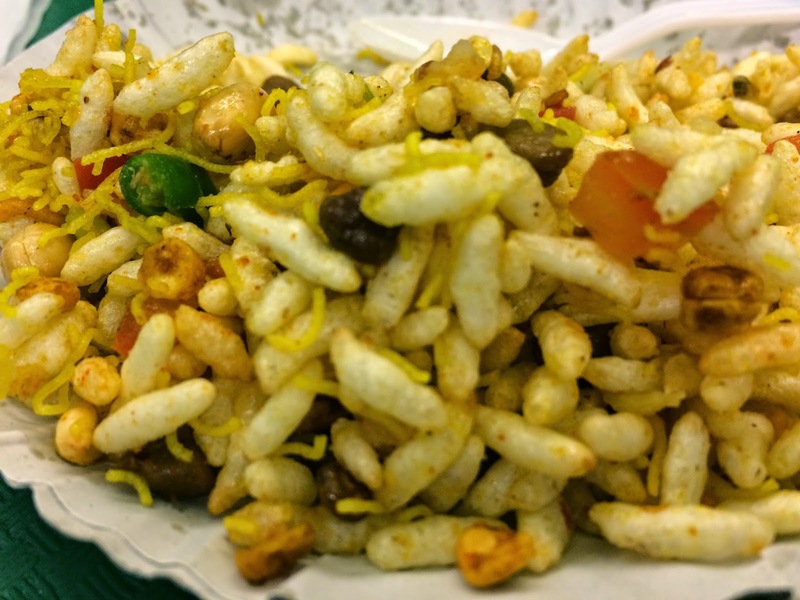 The Jhal Muri looks similar to the Bhel Puri that most of us are familiar with. There are two very important differences which make the taste very different from Bhel puri. There are no chutneys added. The base mixture is completely dry. The second difference, which gives the Muri a completely unique taste is the mustard oil that is added. The result is a real treat to the taste buds! The Mishti Doi is a very simple sweet dish which literally means sweet curd. It is prepared with curd and caramelised sugar. The best things in life, they say, are the simplest. The Mishti Doi is a perfect example of this statement! Slightly off-topic, but very rarely see photos tagged "R to L". Goes against the normal (at least to English and Hindi readers) way the eyes scan the pic. Thanks Sohil. You're right. I fixed that. Isn't the mustard oil in Jal Murhi from a pickle? Also I see the adjacent presentation on nutrition that too in HD. Any interesting find? No clue about where the mustard oil comes from Akhila! I did not go through that poster fully. Nothing seemed out of the ordinary though. I know the author and can get a soft copy though. Thanks Kamal. I wanted only extraordinary information.